What does it mean to wear justice? This question is as old as the Book of Job, one of the most ancient poems in the Hebrew Scriptures. Today, our relationship to clothing is entangled in the most significant questions of justice in our time: poverty, sustainability, race, slavery, and the meaning of work. It can be overwhelming to discern where to begin in a conversation about clothing and justice. The most obvious starting point might be the prevalence of “fast fashion” in the global marketplace. “Fast fashion” refers to clothing that is sold at rock-bottom prices, encouraging consumers to purchase, wear, and dispose of clothing at staggering rates. The 2015 film The True Cost offers a highly-engaging introduction to this phenomenon, with a particular focus on the environmental and human rights problems it creates. If you’re interested in the history of fast fashion, Fashionista offers a helpful timeline here. Other resources focus on the environmental and social problems caused by consumer obsession with cheap clothing. However, fast fashion has only accelerated the ethical concerns already at play in global textile systems. Since the development of synthetic dyes in the 1850s, textile dyes have become a major source of water pollution. Fibers such as cotton raise concerns for their water usage and pesticides. Synthetic fabrics, such as polyester and “microfiber,” shed millions of tons of plastic particles into our water systems each year. And industrial textile production has always been notorious for poor labor conditions, from the Triangle Shirtwaist Factory fire of 1911 to the Rana Plaza collapse of 2013. How can we ever hope to clothe ourselves in justice, when the facts of global textile production are so bleak? One possible answer lies in the popularity of the phrase “ethical fashion,” which often pops up in articles about the best response to “fast fashion.” There are definitely some exciting developments in the realm of ethical fashion, but I’m reluctant to point to it as the solution for a few reasons. First, “ethical fashion” suggests that it is a subset of the larger “fashion industry.” This link limits its audience to people who are interested in fashion, trends, and style. People who aren’t interested in fashion per se may ignore the conversation, thinking it has more to do with design aesthetics than with basic consumer concerns. However, everyone (a few nudists excluded!) wears clothing, meaning that the ethical questions at hand are far larger than what happens during Fashion Week or on the cover of Vogue. More importantly, “ethical fashion” implies that there is a shared, global ethic of clothing, which simply isn’t true. “Ethical” means action rooted in a coherent set of moral principles. These principles usually come from our understanding of how the world works: what “the good life” looks like; who or what determines right from wrong; and how our personal desires intersect with our responsibilities toward others. To speak of “ethical fashion” as though everyone in the world (or even in the US) shares a common ethic simply isn’t accurate. For some people, environmental concerns might be most important. For others, labor conditions or domestic jobs might be paramount. For others, religious convictions come first. Particular concerns such as these tend to get lost in large-scale public discussions of ethics. This is a problem because an ethic that is vaguely defined and impersonal is unlikely to provoke meaningful action. Reflect upon and articulate your ethic of clothing. How does your understanding of personhood, morality, and work intersect with concerns about clothing? What sources or figures from your tradition offer guidance on this subject? What concerns do you share with others, and what are distinctively yours? For example, as a Christian, my own ethic of clothing is rooted in the beautiful and prophetic imagery of the Bible. I call it my “Whole Cloth Manifesto,” and it is a living document, constantly undergoing revision as I share and discuss it with members of my faith community. Make a plan for translating your ethic into action. Personally, this has meant strengthening my sewing skills, avoiding all synthetic fabrics, and supporting my local fiber economy (Fibershed is a stellar resource for this) by purchasing Texas cotton and domestically produced clothing whenever possible. It is, sadly, nearly impossible to find an article of clothing that is completely free from the problems described above. For that reason, it is important to have a sense of priority when it comes to your values for clothing. If you have to choose, does your ethic guide you to purchase a shirt made with organic cotton–mitigating significant environmental concerns–or one made with conventional cotton, but grown and sewn in the USA–allowing greater confidence in fair labor conditions? Practice solidarity with those who make your clothes. Learning at least one hands-on skill related to clothing will help you value your clothing more, and also build empathy for those who create our clothing. You might try mending, sewing, dyeing, or something more in-depth, such as weaving. Learning these skills can also empower you to take steps out of the industrial supply chain, whether by prolonging the wear of your clothes through mending, or crafting your own goods in ways that accord with your values. Begin public action within your own community and people. While there is a time for large-scale industry regulations, the most significant problems in the clothing industry are fed directly by consumer demand. By working within your own community–with people who know and trust you–you have an incredible opportunity to change the hearts and habits of people with buying power. By beginning your activism among those with whom you share a worldview and economic background, you will be able to present a specific and compelling ethic of clothing. Within my faith community, this has meant trying to expand the Christian preoccupation with “modesty” to a larger concern with issues of pride, conspicuous consumption, and environmental stewardship as they relate to clothing. 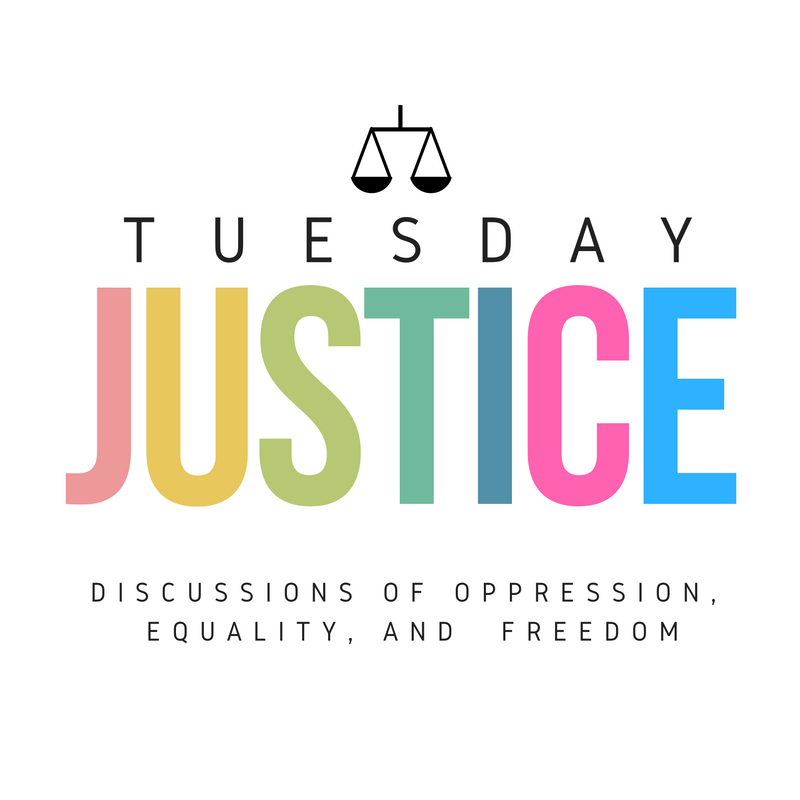 In the spirit of “Tuesday Justice,” it is important to remember that everyday decisions can add up to a lifetime of profound witness and change. If we begin by challenging our own assumptions and practices, we will soon find ourselves speaking (or dressing!) prophetically, mobilizing our own communities and challenging systemic problems. Whether that means wearing organic cotton or “shopping” from your grandma’s closet, you’ll soon find yourself wearing justice like a robe — and that never goes out of fashion. All photos taken by Bethany and stolen (with permission) from her blog, Whole Cloth. Michelle here! Just a quick note about today’s post. No, it’s not the 5th Tuesday of the month, but we’ve got a guest post! We are so thankful to publish this piece by Vershal Hogan while we’re a week into our 2017 Tuesday Justice Survey campaign. We have already seen several requests for more ways to get involved and to tangibly work towards freedom, equality, and justice. That is coming, I promise. But this post isn’t it. With that being said, I fully believe that some of the most important work we can do is in our own hearts and minds. Vershal’s story has encouraged me to come to terms with my own whiteness and how that affects my interactions and relationships. As a person passionate about these issues, it’s mandatory that I regularly confront this in my own life. I hope this story helps you do just that, like it did for me. Vershal and his son quite a few years back, closer to the time of the story than today. At the time, I was in my first year of working for a newspaper in southern Mississippi, in a city renowned for its preservation of antebellum homes and — to some extent even now — culture. Any discussion of race in the city inevitably mentions its historic tableaux, which was originally known as the Confederate Pageant and wasn’t rebranded until the early 2000s, but even outside the spring and fall pilgrimage seasons — in which the city’s garden clubs open their historic homes for tours — the historic realities of the Civil War, slavery and Jim Crow are a part of a complicated history and present. Some embrace that history with unquestioning enthusiasm, waving the banner Lost Cause, while others wrestle with being the inheritors of estates that were built and paid for by human chattel. Many members of the black community are descendants of those slaves, growing up in the shadows of homes that were raised by the blood and sweat of their kin but never gaining any social capital from it. Couple that with Jim Crow and civil rights eras that were as violent as the worst parts of the country, and race becomes an issue that almost always simmers just below the surface. I met David one day while I was out doing an assignment for the newspaper, a weekly feature in which we threw a dart at a map and then went and wrote a story about whatever we found. It was usually an innocuous, inconsequential story, usually something about a grandmother spending time with her grandchildren or about friends who worked on antique cars together – typically, it was something very middle-class. That day was different, however. The dart had landed on a street in a historically black neighborhood that had once been renowned for its success, but had drifted into decay in recent years. My editor had given us a rule that you were allowed to go only as far as one street over from where the dart landed to find a story, and normally that worked. In that town, one street over from shacks leaning in on each other could very easily be gentrified, or just as likely, bourgeoisie. Economic degeneration and revitalization in southwest Mississippi is a strange thing. The street the dart landed on was by far the better of the three choices we had using the one-street-over rule, and even then there was a gang of Bloods standing at the corner eyeballing me and the photographer, Frank. The first couple of houses we approached had “Keep Out” and “Beware of Dog” signs, and when we saw David sitting on a porch, he was working on a neighbor’s kerosene heater, tinkering and trying to get it to fire up. He had a plastic cup and a bottle of cheap whiskey on the porch next to him, whiskey I smelled before I ever saw it. It looked like a lazy afternoon, and he would be someone we could speak with and get a story quickly. After Frank and I both laughed at the comment (I’d been mistaken for being Jewish a number of times, several of them while with Frank in black neighborhoods), we explained what we were doing, and David agreed to talk to us. He talked about the history of his neighborhood (he alleged, among other things, that a nun had been hanged in his house in the 1880s), about his personal doubts about organized religion even though he occasionally attended a church, about how he wanted to help people and how he gathered and distributed information around his neighborhood about how to get back into school, start a business or get corporate grants. He talked a lot about race relations, how they had gotten better and how, in some cases, they had gotten worse. He had a master’s degree in agriculture production and had been part of a program that had the goal of teaching young black men how to be commercial farmers and catfish producers. That had been going well until his work in the field got the best of him, leaving him out of commission for a long time, he said. Through all of this, he would occasionally give me a strange look. Like many people in the South, I’ve got some Chickasaw-Choctaw Nation genes, but I’ve never considered myself to be anything but white and have certainly never been bold enough to try to identify otherwise. Here was a man who — while a little rough around the edges — was educated and articulate (yes, I said it), but conditioned by a dynamic that expected me not to treat him as an equal. His bringing up what he perceived to be my own ethno-racial identity was predicated on the safety of the neighborhood. I don’t remember what I said after that. Back then, making eye contact in conversation wasn’t so much a professional or human courtesy as it was a compulsion because I had a teacher who berated me for not doing so when I talked to her when I was 15. I was just trying to be polite to an adult who was much older than I was, and for a brief moment, I felt a pointless pang of corporate white guilt even though he had praised me for doing what he didn’t expect me to do. I had already come to the conclusion that in the South race problems were rooted in more than just a hatred or disdain for that which is different, that it was a social construct that conflated socio-economics with melanin. The city was the location anthropologists chose to study in the 1941 (at the time) groundbreaking anthropological study, “Deep South,” and though at the time I hadn’t read it, I’d noticed similar dynamics to what the authors published — that racial boundaries are often about maintaining a caste system, which is why, for example, it’s often considered shameful for a rich white girl to date a black boy (even a rich black boy) but not for a white girl from one of the poorer trailer parks. But David then did something that made me realize that everything we do, consciously or unconsciously, reinforces those caste systems. That was the day I really grasped how my own race could import an unspoken dynamic into a conversation, especially with someone who has the living memory of some of our shared culture’s uglier moments. Here I was, a kid just out of school interacting with a man three times my age and with twice the education, and he was socially conditioned to assume I wouldn’t grant him a basic courtesy, whether out of a sense of superiority or fear. Until that point, my general beliefs about racism had been facile, the thought that if one does not speak or think with overt hatred they’ve covered their bases, and a few years later, when talk of non-verbal racism became mainstream, I thought back to that occasion. The story I wrote from that afternoon, like many dart features, wasn’t very long or memorable. I’m sure that if David even read it, he laughed at it, as he would laugh at this writing. But I remember it, and sometimes I still think about it. Since then, I’ve had opportunity to attend sessions where black people — especially older people — talked about the conditioning that was drilled into them from a young age, how they weren’t to look certain people directly in the eyes, how deferential language was non-negotiable and even how where one positioned themselves in a room or a public space were important considerations. While most of the overt behavior codes of the bad old days are now gone, the complexity of our interactions continue; in fact, it may be more difficult to root out now because most people will affirm that racism is bad, and thus don’t want to admit their own shortcomings. I am fortunate in that I don’t get to qualify my own failings with the old social crutch of “That’s how I was raised;” our home was pretty open. But the culture around me being what it was, there were a lot of unconscious cues that I absorbed, and I’ll admit that there are still things I have to work on. But I’ll give this: If I have to be called out for something, I’ll at least be looking you in the eye. The truth is that nobody knows what actually causes terrorism to a point where we can generalize the motivations of all terrorists. There are different levels of explanation – social, individual, structural or political motivations – and whilst each may play a part, the dominant narrative takes a religious ideological approach as fact without any demonstrated scientific basis. How well do we as a society really understand the causes of terrorism? Since 9/11, and especially 7/7 in London, we’ve been fed the line that Islamic ideology, rather than politics, causes extremism, each new ‘Islamist’ attack apparently proving the theory. And because the theory that terrorists are mentally deranged has no scientific basis, what really drives individuals to engage in this kind of socially deviant and devastating behaviour, sometimes even to a point of killing themselves as well? Is it primarily religious ideology? Is it politics? What is the effect of choosing one narrative over the other? Following a ‘jihadist’ attack, news coverage hysterically focuses on how individuals were radicalized by an increasingly fanatical Islamic ideology (white-supremacist attacks, conversely, receive far less attention), often with a backdrop of a failed personal life or a lack of integration into modern Western society. The actual motivations for the attacks are rarely investigated. 9/11, the Boston bombing, 7/7 in London, the Brussels attacks, Paris, Florida, Madrid are frequently implied by media and politicians to have no aims other than instilling senseless terror on the basis of a warped interpretation of Islam. It is often ignored that such atrocities attempt to accomplish a goal or communicate a political message. All definitions of terrorism have at their core some political or social aim, but aside from passing comments, we don’t hear about these in news coverage. There is a growing body of literature (see here, here and here) that suggests this direction has been encouraged by governments to silence dissent over their foreign policy; it is in Western governments’ interests to ascribe the attackers’ motivations to reasons other than their military interventions and the so-called ‘War on Terror’. It’s a natural defence mechanism to place the blame for attacks like 9/11 on anything but their own actions (be it invasions, drone strikes, or Guantanamo). Muslims do not “hate our freedom,” but rather, they hate our policies. The overwhelming majority voice their objections to what they see as one-sided support in favor of Israel and against Palestinian rights, and the longstanding, even increasing support for what Muslims collectively see as tyrannies, most notably Egypt, Saudi Arabia, Jordan, Pakistan, and the Gulf states. And above all, there is nowhere near enough scientific research into individuals’ motivations to cast generalizations (and where studies have occurred, they often find social interactions play the most important role). The truth is that nobody knows what actually causes terrorism to a point where we can generalize the motivations of all terrorists. There are different levels of explanation – social, individual, structural or political motivations – and whilst each may play a part, the dominant narrative takes a religious ideological approach as fact without any demonstrated scientific basis. If that perspective only seems like common sense, it’s because it has been constantly emphasized by politicians and the media over time. No study has had anywhere near sufficient access to terrorists to show any causation. However, these unfounded assumptions cause us to view certain communities (those perceived to be Muslims) as suspicious, based purely on correlations with widely-publicized attacks that have previously taken place. In Britain for example, following the IRA Birmingham pub bombings, those with Irish accents were viewed with suspicion and hostility; similarly, the now-suspect ‘Muslim community’ is placed under constant suspicion of being a potential threat following jihadi attacks. Studies into the creation of suspect communities show they are treated with disdain and blamed for attacks, that they experience negative interactions with the police, racism and discrimination at work, and feel unsafe walking around and like second-class citizens. Only the government could have made a terrorist out of Mr Cromitie, a man whose buffoonery is positively Shakespearean in its scope… I believe beyond a shadow of a doubt that there would have been no crime here except [that] the government instigated it, planned it, and brought it to fruition. Governments have gradually diluted the threshold for ‘terrorism’ charges: in the UK, non-violent extremism is now a criminal offence, and thousands of children as young as four have gone through the British de-radicalization program. Umm Ahmed, a British Muslim, was jailed for 12 months for the possession of Inspire Magazine which she had obtained to keep updated with her brother’s trial (apparently reading the magazine online does not land you in jail, but possessing it on a USB stick does!). In sentencing her the judge said that Umm posed no threat, that she had no intent to harm, that she was not a terrorist – and even that she was a good Muslim – but that he had to imprison her based on her possession of the magazine. The idea of a distinct and definable ‘Muslim community’, separate from the rest of the population, has been encouraged by the provision of cohesion funding that targets places with a certain number of Muslims, and by politicians calling for this apparently distinct community to condemn the latest attacks as though they were in some way collectively responsible. David Cameron in his (in)famous multiculturalism speech called for moderate Muslims to condemn the radical ones, and Trump similarly called on Muslims to “report when they see something going on”. This leads to Muslims being seen collectively as a threat, and advancing the perception of them as separate to ‘the rest of us’. In turn, like after the recent Manchester bombing, we see a rise in hate crimes against those perceived to be Muslims, who are often approached in public and told, “shame on you… for what you did”. People have been killed as a result of anti-Muslim attacks, although like other right-wing extremist attacks, they get far less attention than what is considered ‘Islamist’ violence. We have become obsessed by denouncing those engaging in political violence as deluded Islamist ideologues, when in fact, by their own testimony, the attacks they carry out seem much more like retaliations for Western policy decisions, like invasions and occupations, support for Israel (which is taken as definitional support for the oppression of Palestinians), Guantanamo, drone strikes, and so on. Claims that ideology is the overriding explanation are wholly unfounded and exist to minimize Western governments’ responsibility in motivating the attacks. However, because of these narratives being endlessly repeated, we have succeeded in separating Muslims from non-Muslims, and non-Muslims from Muslims, allowing totally irrational fear and distinction, rather than unity, to triumph.